This article is about the microgame in WarioWare Gold. For the compilation game, see amiibo tap: Nintendo's Greatest Bits. Info "Tap the amiibo on the bottom screen of the New Nintendo 3DS. And FYI—not everything that looks like an amiibo is an amiibo, so be sure to check your items closely. Figures or cards that you can link to Nintendo games are called amiibo. They were first released in 2014." amiibo Tap is one of 9-Volt's microgames in WarioWare Gold. The player must move the amiibo to the New Nintendo 3DS. 1st level difficulty: Only the amiibo appears. 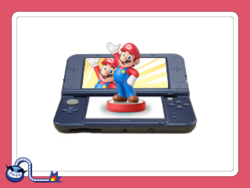 2nd level difficulty: A random object appears alongside the amiibo. 3rd level difficulty: A random object from level 2 and a fake amiibo appear alongside the real amiibo. This page was last edited on April 2, 2019, at 12:04.